Filed under Buy Flowers, Wedding Flowers. Our Romance Revival Bouquet hits all the winter wedding trends from silvery eucalyptus to striking anemones. An important factor in any wedding is choosing a color palette that works for you and a winter wedding provides many opportunities for unique and wonderful choices. Some traditional options for winter flowers for wedding arrangements and bouquets honor the idea of a winter wonderland with a frosty palette. Colors like light blues, silvery grays and whites, paired with rich, dark tones, is a classic winter wedding selection. Wedding planners and florists are welcoming a more modern and industrial vibe this coming year with bright whites and metallic elements like silver and tarnished golds entering the fold. Barn weddings are popular and perfect for summer but many winter brides are opting for warehouses or more industrial-style venues to get hitched this year. Florals that lend themselves well to this feel also work with a winter palette. Flower fillers like eucalyptus and dark, striking flowers can set a more urban, moody feel, perfect for a modern setting. Wedding trend watchers are also anticipating the comeback of creamy whites and blushes this wedding season. A winter wedding is a great time to take advantage of this palette; what is more romantic than the color of flushed cheeks on a snowy day? If you wanted more inspiration, take a look at our Romance Revival Bouquet. 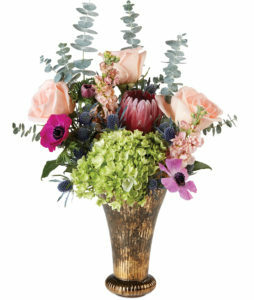 Pink anemone, another hot wedding flower, has a jet-black center that create a striking look paired with light peach roses, silvery eucalyptus and blue thistle. What’s more, this bouquet sits in a patina copper vase, playing on the metallic theme that is so in this wedding season. This romantic bouquet has so many beautiful elements that pair seamlessly with the rest of a wedding’s décor. Add this bouquet to highlight your other wedding flower arrangements by placing it on a sweetheart table or in front of the couple’s seats at a reception. A shiny example of mercury glass: the newest wedding centerpiece trend! Those who have been following wedding trends will recognize the popularity of mason jars and other rustic elements the past few years that work with the ever-popular barn wedding. But this year, some are predicting that mason jars are out and mercury glass is in! Falling in line with the modern-industrial aesthetic, wedding centerpieces are starting to come in vessels and cachepots of all types. However, mercury glass seems to be the new mason jar with its silvery sheen adding to the metallic colors that are beginning to appear. Wedding planners are also seeing more requests for interesting flower containers with geometric patterns and shapes. Thinking about winter flower arrangements from the tip-top blossom to the bottom is important and we are excited at the prospect of new textures and colors to play with. 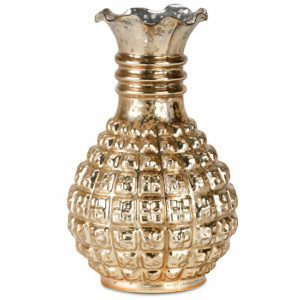 We have plenty of mercury glass options but one that would work with a winter wedding is our Golden Mercury Vase. Its gold finish is just shiny enough and shows off the geometric detailing that recalls snowflakes. 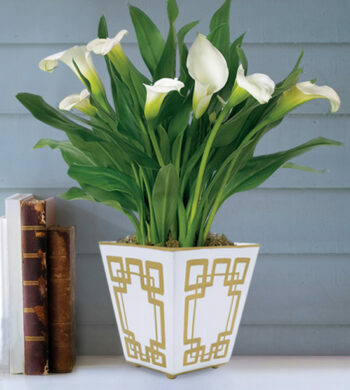 Add white hydrangeas or exotic orchids to this vase for a striking centerpiece for any wedding reception table. Longer tables have been popular in recent years and this is a trend that will most likely continue which makes way for larger centerpieces and garlands as an option at a wedding reception. While large centerpieces in captivating holders such as mercury glass will provide a stunning sight, garlands are popular for a more relaxed option. Silvery greens like eucalyptus or dusty miller is great for the winter wedding season as these leafy greens can be worked into twisting vines and hold up well. Guests can feel comfortable without worrying about knocking anything over or talking around a large centerpiece. In addition, garlands are a perfect for integrating other elements from the wedding into the floral décor. For example, brides going for a woodland theme can integrate more woodsy, preserved pieces or adding more onto a table. Or, consider weaving in a sprig of holly or pinecones into the garland or simply place at each table setting as a charming way to continue a theme. 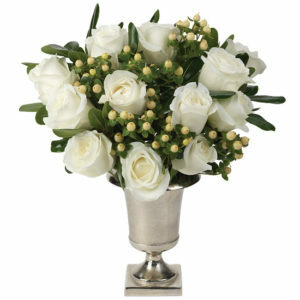 Timelessly elegant, white roses can help create a wonderfully white, winter wonderland. And if you are still figuring out what wedding flowers would work best for you, classics like gerbera daisies never fail. 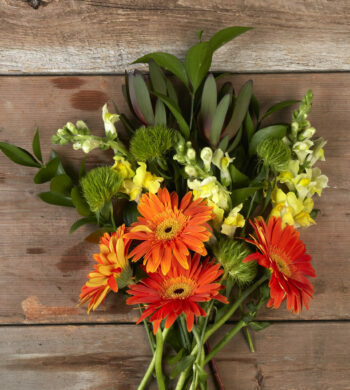 Sweet and happy, gerbera daisies will add to the positive and cheerful spirit of a wedding. Gerbera daisies are grown year-round and come in an array of colors so this becomes a flexible option for brides. 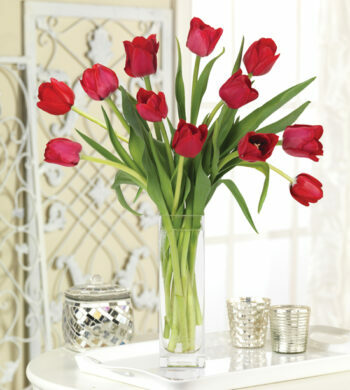 This bright bloom is also a classic symbol of love that livens up any space with bright pops of color. 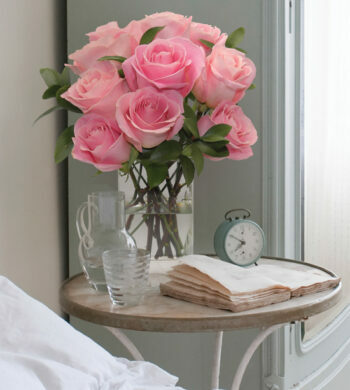 Another classic that is seeing a return are what some consider “old-fashioned” blooms like roses. Like gerbera daisies, roses are readily available all-year, making them a great winter wedding flower. Roses have enough shape and body that fill out bouquets and wedding centerpieces for a full, lush look and are quite versatile. For a darker palette, red roses are wonderful and if we are following the trends for this wedding season, Timeless White Roses are perfect. From the silvery vessel to the pure white roses, this bouquet is elegant and, well, timeless with seasonal elements like vanilla hypericum berries and dark greenery. We are always excited to follow the trends and looks for each wedding season as we love to share what’s new in the wedding world with all our happy couples looking for wedding decoration ideas. But as enthusiastic as we are, make sure to pick and choose the wedding flowers that will work best for you. Weddings should always reflect the couple and what they need or want for their special day. From a renovated warehouse to a snowy church, any commemoration of love is sure to be the perfect choice as long as it reflects the happy couple!